Cecil Murray was born November 21, 1894, in Covington, Indiana, daughter of Timothy J. Murray, a real estate broker and longtime local Democratic leader, and Jennie Clotfelter Murray. She attended public schools in Covington and entered Indiana University. Later that year she left to teach school in Troy Township, Indiana, and in the public schools in Covington. On December 22, 1914, she married Frost Revere Harden, who eventually became a Covington automobile dealer. They had one son, Murray. That strategy could cut both ways, as Harden found out in 1958. The election was something of a referendum on President Eisenhower’s economic policies and an expression of voter frustration with an economic recession. Her district, with industry centralized in Terre Haute, was particularly hard hit by unemployment. Harden lost her campaign for re–election in a tight race to Democrat Fred Wampler, a Terre Haute high school football coach, who prevailed by little more than two percent of the vote. She was one of seven Indiana Republican incumbents who lost in a national Democratic sweep which cost the GOP 47 House seats that fall. Overnight, Indiana’s House delegation swung from a 9–2 GOP advantage to a 9–2 Democratic advantage. 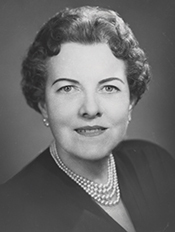 Two months after leaving office in January 1959, Harden was appointed special assistant for women’s affairs to Postmaster General Arthur E. Summerfield and served until March 1961.17 In August 1970 President Richard M. Nixon appointed her to the National Advisory Committee for the White House Conference on Aging. Afterward, she retired to her home in Covington. Cecil Harden died on December 5, 1984, in a nursing home in Lafayette, Indiana. 1Joan Cook, “Ex–Rep.Cecil Harden Dies; Worked for Women’s Rights,” 8 December 1984, New York Times: 17. 3“Five to Map GOP Strategy,” 5 June 1949, New York Times: 42. 4Current Biography, 1949 (New York: H.W. Wilson and Company, 1949): 243–245; quote on 244. 5Hope Chamberlin, A Minority of Members: Women in the U.S. Congress (New York: Praeger, 1973): 210. 8Elizabeth Ford, “My Wife Went to Congress,” 5 January 1955, Washington Post: 29. 10Marie Smith, “Women Legislators: Plan to Push Equal Pay Bill,” 27 March 1957, Washington Post: C3. 11“Women Blamed By Rep. Harden for Own Plight,” 5 March 1949, Washington Post: B3. 12“Wilson Tells Armed Forces to Stop Work That Private Firms Can Do,” 16 December 1953, Wall Street Journal: 2. 13“Wilson Tells Armed Forces to Stop Work That Private Firms Can Do”; “U.S. Urged to Quit Coffee Roasting,” 24 December 1953, New York Times: 21. 14Susan Tolchin, Women in Congress (Washington, D.C.: Government Printing Office, 1976): 36. 15Chamberlin, A Minority of Members: 212. 16George Dixon, “Washington Scene: Strain on the Coattail,” 16 June 1955, Washington Post: 15. 17“Mrs. Harden Gets Post Office Job,” 11 April 1959, Washington Post: B4. Papers: 1938-1984, 25 boxes, 6 oversize boxes, and 2 cassette tapes. Contains correspondence, speeches, legislation, news releases, expense accounts, military academy appointments, news clippings, speech notes, and photographs. The correspondence is both personal and political. A finding aid is available in the repository and online. Papers: In the Pluma Burroughs Penton Batten papers, 1948-1964, 12.5 boxes. Harden included among correspondents. "Cecil Murray Harden" in Women in Congress, 1917-2006. Prepared under the direction of the Committee on House Administration by the Office of History & Preservation, U.S. House of Representatives. Washington: Government Printing Office, 2006.